TDP: In April El Salvador celebrated a National Reading Week, are there any more programs like this planned in the future? M.A: The idea of the Secretary of Culture is to make reading programs permanent. In conjunction with the National Library of El Salvador and through the mobile library, we can promote readings in the parks during the weekend, in workshops, and we can invite youth and children as our target audience. TDP: As the director of the National Library of El Salvador, what programs offer the library for children and youth now? M.A: For right now there is only the Mobile Library, but we are trying to do an average of ten days a month of reading using the Mobile Library. We are also participating in the Week of Readings (the International Day of the Book, in the month of April) and in the National Reading Committee that is formed by a number of public organizations and with the Secretary of Culture. TDP: What plans are in the future to motivate the Salvadoran children and youth to read? M.A. For right now we only have the Mobile Library but we may add two more but it’s not really for certain. It will depend on international support. We also have the Workshops, which help facilitate reading. The first lesson in the workshop deals with the fact that you can’t have literary creativity without immersing yourself in reading. This is even more true in writing poetry. TDP: Do you think, there should be poetry workshops for children and young adults in El Salvador? M.A: Of course, this is one of things that people are missing. I’ve confirmed the effect that literature and the creative process has had in programs to prevent violence. And that’s how in 2009, in my personal project, not with the Mobile bus, we were able to fund various workshops in Centers for Education of some cities. We had to suspend it because of lack of funds and of time. The cities in which there are Workshops, all of them are vulnerable to violence. That’s where we have to go and increase access to the arts and to artisan workshops. Also San Salvador is one of the five most violent cities in the world. TDP: Oral tradition has enriched the Salvadoran culture for years, do you think oral tradition plays and important role in reading? M.A: It’s certainly an important part as long as it brings back the values of a national identity. Many necessitates are covered: youth are paying a lot of attention to what they hear from their grandparents, the desire to read can be replicated and they recognizing the value of oral traditions. TDP: Do you think that doing poetry workshops and poetry festivals would help the Salvadoran children and youth become better citizens? M.A: Of course, because through the stimulation of creativity, sensitivity, all kinds of values that come about through the reading of literature, you can support the prevention of violence. Also, it helps to produce critical thinking and positive behavior and all of this signifies greater democratic participation. Right now we only have a representative democracy and that’s not enough. TDP: Do you believe that organizing poetry workshops and poetry festivals would help Salvadoran children and youth to stay away from becoming gang members? M.A: We need to facilitate action that allow for national pride, raise self-esteems, generate leadership, promote and give leadership opportunities for youth in vulnerable areas with limited opportunities. They only have violence and bitterness to express themselves with. Responses to economic and physical violence to exercise against them for many decades. It’s always been said that the right-wing penal code is for the poor and the civil rights. It’s from there that you have the fertilizer for the roots of violence. The examples for violence come from above, as Confucius said two thousand years ago. TDP: Some years ago you published with Children’s Book Press in San Francisco, CA, a wonderful book, Magic Dog’s of The Volcanoes, are you thinking of writing more children’s books, or have you already written more? M.A: Yes, I have also published El Cipitío as a bilingual edition in Costa Rica. Right now I am attempting to publish La Siguanaba but the process has been suspended because I no longer had the necessary funds leaving only the illustrations and the formatting of the books ready to publish. I have three other stories geared towards youth and children which I have presented yet to any publisher. 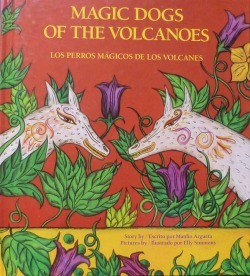 All of them are based in legends or folk tales of Central America or Latin America. In conclusion, I currently have four stories ready to go. TDP: Salarrue, Claudia Lars and Alfredo Espino, are among the Salvadoran writers who wrote poetry and short stories for children, are there any more Salvadoran writers who write this genre, who are they? M.A: There are only a few. I’ve only read poetry by Maura Echeverría. Jorgelina Cerritos who recently won the award of the Latin American, Casa de Las Americas, María Cristina Orantes. TDP: We are aware that El Salvador is a poor country and that most families prefer to buy food over books. As the director of the National Library, how do you think the Ministry of Culture views the situation? Do you think Salvadoran’s will continue to choose food over books? M.A: Let me tell you how I see things as a citizen and as the director of the National Library. On this issue of not counting on the basics, there is a contradiction. There are a lot of poor families, I’m not talking about the poorest who only have one tin room to live in or those who survive off of a dollar a day; but many within the category of poor consume what the market provides: cellular telephones, tennis shoes, tvs, but they don’t have enough money to buy books. Let’s not discuss the fact that they don’t have enough money to buy a beer or to go see a football game. Then, what is necessary is to facilitate their reading, to make books necessary, like tortillas and beans, and it has to be part of the regular grocery basket. We need to take reading and books to the most vulnerable communities. The results are surprising. People are interested in knowledge, in the feel of books – you have to start with something. We’ve seen this enthusiasm and interest in our Mobile Library program. TDP: How many public libraries are in San Salvador? M.A: There is one in the city and two more in the metropolitan zone. But in total, in the entire country we have 15 public libraries. We are considering the idea of increasing those. There also exists the seed of libraries in the library at the Casas de la Cultura, and there are more than 150 of those located in all of the country. .
TDP: What could you say to the Salvadorans who live in the country and to those who live in other parts of the world about our children’s literature, and why is important to emphasize reading among children and youth? M.A: As I’ve said before, literature helps form and educate people, facilitating positive emotions. In the end, this is important if we take into account youth violence that is present in El Salvador. We’re currently paying the cost of more than five decades of indifference and coldness against reading and books. It will not be easy to create solutions in the short term, but educational Systems must pay a crucial role.